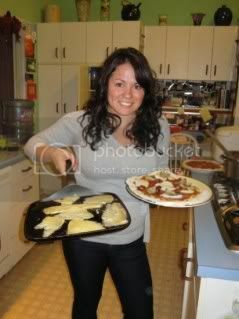 On a recent trip home, I spent all afternoon with my family making homemade ravioli. It’s not as daunting as you think and the fruit of our labor was well worth it. We made butternut squash ravioli with butter sage sauce and spinach ricotta ravioli with homemade marinara sauce. I’ve included both fillings here. So put on some Italian Opera, roll up your sleeves, pour yourself a glass of vino and begin. Note: it is best to have a pasta machine. Most fun with a group of your favorite people. Blend all ingredients in food processor until very smooth. Be sure the mixture isn’t too “wet” as you want them to be sticky enough to form into small balls for the filling. Blend all ingredients with a mixing spoon until smooth. Set aside. Crack eggs in small bowl. Whisk or beat with fork or your fingers. Make mountain of flour on a flat surface like your table, and form a well in the center of it. Pour in 1/2 of egg mixture and begin mixing egg into flour with 2 fingers while supporting the mound of flour with your other hand, adding in the rest of the egg mixture once the dough gets going. Knead dough for 5 minutes, flouring surface with semolina as needed. Form dough into ball and wrap tightly with plastic wrap. Set dough aside to rest 15-30 minutes while you make your filling. After dough has rested 15-30 minutes, gently flatten the ball of dough and cut into 4 pieces with a knife or dough blade. Roll out first piece. Work quickly so dough does not dry out. Keep extra dough in plastic wrap. To use Ravioli machine: Run the piece of dough through the ravioli machine. #1 setting on knob, roll the dough through. Then fold the dough into thirds. This actually helps to knead the dough even more. #1 setting for 2nd time. Roll the dough that was folded into thirds through again. Then add a little flour. Fold into thirds again. #1 setting 3rd time. Run dough through machine. Fold into thirds. #2, #3, #4, #5 settings. Not necessary to fold dough for 2-5 settings. Note: While putting it through, be sure to make the strip of dough as wide as the pasta machine. Next, you form the ravioli either by hand or with a ravioli maker: (looks like an ice-cube tray, see above). Ravioli are more uniform, quicker to make and, seals tightly with this. Make By hand without the ravioli maker: Use rolling pin to roll dough into thin strips, about 3” wide, and about the thickness of a nickel. Drop 1 tsp of filling a couple inches apart, then brush center, edges and in between each ravioli with egg wash. Fold over the other half of the dough like closing a book, and seal by pressing with fingers. Make sure no air is trapped inside. Use a pizza cutter, knife, or ravioli cutter to make each ravioli. 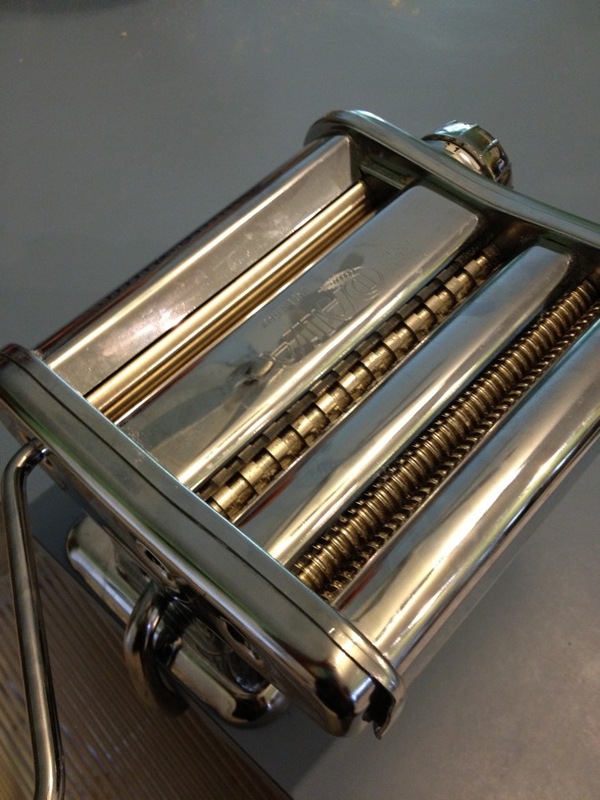 To use the ravioli press: Place the long strip on the floured surface. Measure length of dough to be slightly longer than the ravioli maker (ice cube tray thingy). 2 strips needed. Next place 1st strip of dough flour side down (so it is easily removed from form) onto ravioli maker. Make sure dough reaches to the edges. Then, press gently with the ‘white form’ to make the wells for the filling. Fill the wells with 1 tsp of or so filling. Take the 2nd strip of dough, flour side up. Gently press down to get all the air out. Use a rolling pin, to roll over the top of the ravioli form to cut the edges to form ravioli. Boil water, drop ravioli in for approximately 4 minutes. Drain and take out, serve with your choice sauce (we liked a browned butter with sage leaf sauce for the butternut squash) and for the spinach ricotta we used our family’s marinara recipe. Aw that looks like so much and SO good!! I just tried making pasta for the first time a couple months ago and its so worth the extra effort! 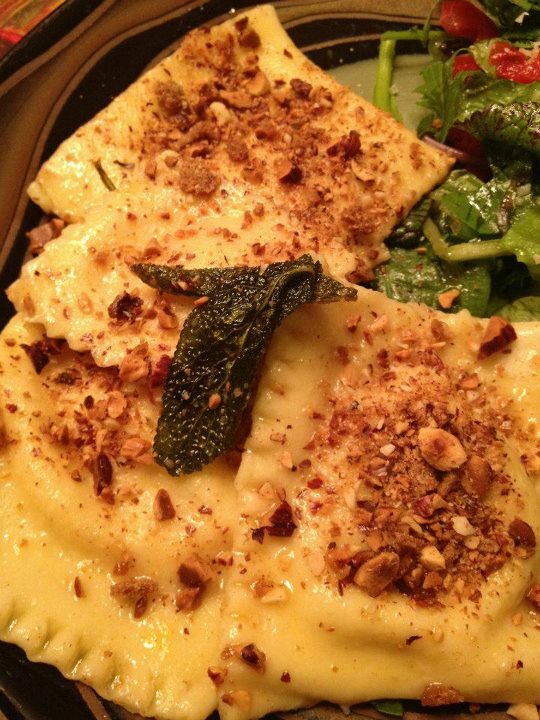 Your butternut squash ravioli sounds amazing!! You have made making ravioli looks so simple! Loved having you home. Great post; ravioli is my favorite! Loved it too 🙂 Thanks! I love the picture of Cerna watching and smiling from down below! Haha I LOVE that too. Didn’t even notice. Cerna, the dog, is looking at the long piece of pasta dough, happily remembering when I left lots of raw ravioli in the car in Boulder, and he ate all of it. That was a long night….